Racquel Goodison is an Assistant Professor of English at the City University of New York. She has been a resident at Yaddo and a recipient of a scholarship to the Fine Arts Works Center as well as the Astraea Emerging Lesbian Writer’s Grant. 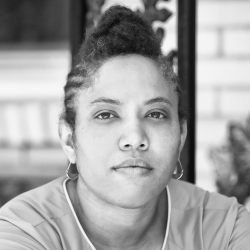 Her stories, poems, and creative nonfiction have been nominated for the Pushcart and can be found in such literary journals as theBlack Arts Quarterly,Proud Flesh Journal, Kweli Journal, Her Kind,and Drunken Boat. Her most recent projects include Salt, a collection of short shorts, andIsland Girl, a short story collection.